Welcome to London … sorry about your hearing! 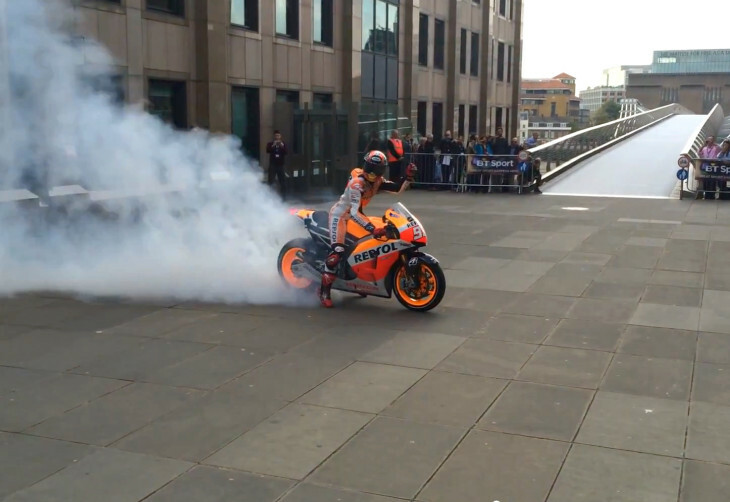 In the two videos below, Honda’s reigning MotoGP champ and current points leader, Marc Marquez, rides his factory bike across the Millennium Bridge, and then proceeds to lay down a huge, smokey burnout (you will notice the difficulty he has breaking the rear tire loose with only 250 bhp … ha ha). Not sure whether those observers at the end of the bridge will ever be able to hear normally, again. A MotoGP bike at close range is far louder than your typical rock concert. The occasion, of course, is this weekend’s MotoGP race at Silverstone. Marquez has won an amazing 10 of 11 races so far this year (the first 10 in a row). We thought “silly season” was over, but Gresini Honda rider Scott Redding is threatening to leave the team despite a two-year deal that should see him through the 2015 season. Gresini promised Redding a full factory Honda in his second season, but is apparently having trouble raising the funds necessary to make the bike available to the young Brit. Redding has flatly stated he will not spend another year aboard an Open bike fighting for scraps. If he can’t have a full factory ride next year, he will sit out. 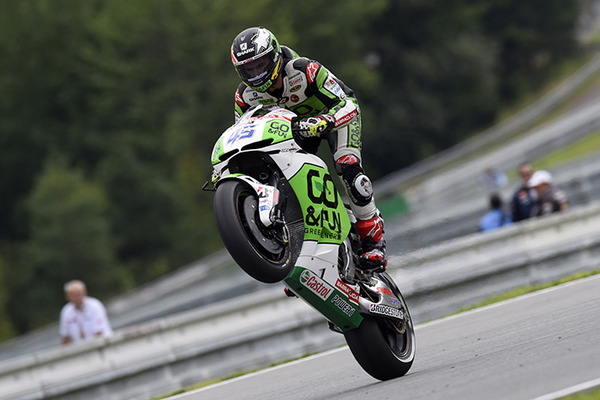 Despite how late it is, many options appear open to Redding. He has ridden the underpowered Open class Honda superbly in his rookie MotoGP year, and he narrowly lost the 2013 Moto2 championship to Pol Espargaro, another exciting rookie in MotoGP. Ducati, for instance, has already contacted Redding’s manager to indicate it is interested should Redding defect from the Honda camp. forgone conclusion #1… Marcus on pole, clear by .311 seconds. My bike smokes like that without the tire spinning – what’s the big deal? The performance: I give it a 2.5 out of 10. Not at all entertaining. Is this how you make friends amongst non pro-MC people? HL Rembe, while I agree with you it is very tiring considering what the non-riding public think of motorcyclists, it is very important to consider them because they vote. They vote to restrict motorcycle riding areas for off road riding. They vote to increase noise restrictions to the point that in some places you cannot even ride your own dirtbike on your own property if it can be heard at all over your property line as it is a public nuisance. They vote to limit the off road riding season. They vote to increase regulations of performance and emissions on street motorcycles. They vote to restrict motorcycles from certain roads and other areas. Why do they vote to restrict motorcycles when they themselves do not ride? If you ask them they will tell you they think all motorcycles are an annoyance, noisy and disruptive and that most motorcycle riders are irresponsible dregs of society deserving of being regulated. Those that ride know that there are no greater percentage of irresponsible riders and loud noisy bikes than there are percentage of car drivers and annoying loud cars. But the nonriding public only recalls the 10 riders and bikes that annoy them and not the 100 other riders and bikes that did not annoy them. While every thing you point out is 100% correct what have we GAINED by remaining silent and invisible? nothing. We, the motorcyclist, are an economic force and in our “group think” societies that is the only force that gets recognition. As long as we remain an un unified force trying to win ground through appeasement we will continue to lose. Learn the lessons of other minority groups and become a visible force to be reckoned with and we will win that ground. You might have well written a Press Release for the AMA. American Motorcyclist Association covers pretty much all of that. Vote your politicians by whether they are friendly to Motorcyclists (not trying to legislate us out of existence). Vote with your dollars by patronizing motorcycle friendly businesses (if a hotel looks down on you because of your ride, go to a hotel that appreciates us, and our tourism dollars). The AMA agrees on trying to stay quiet on your cycle so as not to piss off the 95% of the voting public that does not ride, but does vote. But they also open their mouths in local and national political circles to protect our rights so we can keep riding. Remember a decade or more ago, politicians were looking at a “prototype” motorcycle that would be safer? The thing had two wheels i think, but had a roll-cage, maybe outrigger to prevent tipping too far, a seat and a seatbelt..! If no-one spoke up then we could be “riding” those things!! Check out the AMA (AMA-Cycle.org), join if you like (think of it as one more monthly magazine subscription that does a LOT of good). And get loud when it comes to protecting your rights, so we don’t have a bunch of uninformed politicians making those decisions for us! $8/gal. gas helps with that, as does an older, more tolerant society in general. +1 what Dino says. Burnouts and straight pipes are not being a “force to be reckoned with”, it’s just reinforcing the opinions of those who are already against motorcycles. That said, an international star performing a planned spectacle is not the same thing at all. I’m sure this was great for everyone who came out. Should we mount an all out assault on Washington DC and encircle the city with 100,000 bikes and jam up the streets of DC so the city grinds to a halt? And what will that prove other than the motorcycle riders are an unruly bunch. That just reinforces the low opinion all the other non-riding public have of us. Support the AMA and groups like them. Yes that is something but minimal at best. Vote with your $ to motorcycle friendly businesses. Always! And even so it is a paltry portion of the economy compared to the 95% of the consuming public that does not ride. As for arguing we are a “minority” that is a losing position because we CHOOSE to ride a motorcycle. We will also gain no sympathy by arguing we are an “oppressed” minority when we are free to choose to be part of the oppressed minority or not. The only realistic solution I can see is for the motorcycle community to grow up and face the facts of life in the modern world. Part of facing facts and growing up is to condemn hooligans and outlaw pirate wannabes and so that those images and attitudes are shunned from motorcycle society and hopefully will diminish with time. This starts with each rider, every time they ride. It does not start in DC or in AMA HQ. It is the responsibility of every rider, every ride. There is a time and place to be a hooligan, in the middle of a busy street is neither the time nor the place any more than it is the time and place to do donuts in your hotrod. You can choose to be part of the solution or part of the problem. Happens every year on Memorial Day weekend, it’s called Rolling Thunder. People generally like it. You gotta love him! LOL!